A spokesperson from the Legalise Cannabis Society, UK, 2003. Photo: Andrew Milligan/PA Archive/PA Images. All rights reserved. People who use drugs face widespread stigma and criminalisation. This is well-known. But drug policy discussions often centre on men. The experiences of women, trans and gender non-conforming people who use drugs are ignored and silenced – though they face particular challenges accessing care and the gendered stigma of being perceived as unfit parents and ‘fallen’ women. It would be “impossible to separate what is more important for me – accepting myself as a person, who enjoys psychoactive substances, or as a woman, whose transformation is scary for other people, and a joyous process for me,” said one of the participants at the Berlin meeting. She challenged us to understand that, used safely, drugs can contribute positively to people’s lives. 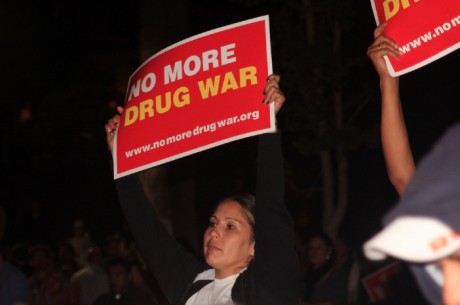 Rally to End the War on Drugs, Los Angeles, 2011. Photo: Flickr/Neon Tommy. CC BY-SA 2.0. Some rights reserved.Women who use drugs are also at higher risk of domestic and sexual violence, but they face more barriers in accessing support. They may face humiliation and discrimination in accessing healthcare, including during pregnancy and childbirth. Too often they're not treated as individuals with autonomy and dignity. They may be excluded from domestic violence shelters, or risk losing their children if they seek help. Feminists created these shelters to support all women facing violence. But many cannot respond to the specific needs of women who use drugs. When women cannot access support in shelters, they may stay in violent and abusive situations. We can and must do better. As feminists, we must listen to women who use drugs and stand for solutions such as harm reduction that challenge systems of oppression. All people are entitled to responses centred on care, compassion and individual autonomy.